Pure Swiss dark chocolate and fresh cream blend to form a smooth, seductive truffle center. Finished in Swiss dark chocolate. 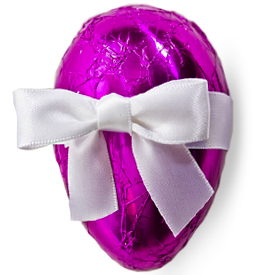 Wrapped in bright purple foil and decorated with a white bow. Dark Chocolate (Cocoa Mass, Sugar, Cocoa Butter, Soy Lecithin, Vanilla), Cream, Dextrose, Invert Sugar.